Does BYOD Guarantee Employee Satisfaction? | Blue Mountain Data Systems Inc. Does BYOD Guarantee Employee Satisfaction? Year after year, organizations poll their employees to determine whether they are happy with their jobs. Unfortunately, recent statistics dictate that about half (52.3%) are not. With a BYOD mindset, you can ensure everyone in the workplace is using office equipment to its fullest potential. Employees who are allowed to have their personal devices with them find it easier to make it through the workday. This also increases employee retention rates as well as creates a feeling of job satisfaction. When employees have their own smartphones in hand during the workday, they are able to stay in contact with colleagues and clients even if they aren’t at their desks. In addition, employees who use their own smartphones complete work-related tasks faster than employees using unfamiliar devices. When your employees bring their own devices to the office, it reduces the amount of technology your business needs to provide. This means maintenance, IT staffing, hardware, and software expenses decrease exponentially. Juggling multiple devices make life harder for your employees, it makes life harder for your IT departments when troubleshooting issues arise. By going the BYOD route, you can streamline the technology in your workplace. If an employee has an issue with their personal device, they are more likely to take the initiative to deal with it. This gives your IT department a break because it makes your workers self-sufficient in terms of their tech needs. When you take on a BYOD policy at your workplace, it’s a win-win for employees and your business. 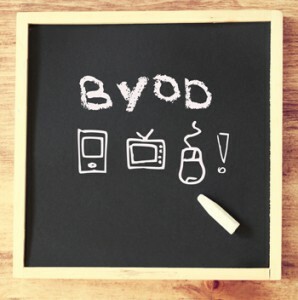 For more information on BYOD and how it may increase job satisfaction, read the full article.